Are you tired of losing your glasses? May I suggest the collection of chic eyeglass jewelry at EyeGlassHolders.com? They have a huge selection of handcrafted beaded eyeglass leashes, leather eyeglass leashes, gorgeous glass beaded eyeglass necklaces and hand cast pewter eyeglass pins that express your personal style AND keep your glasses close at hand. 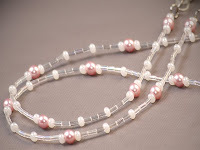 Soft, delicate look designed in pink clear and off white beads give you a pretty way to hold on to your eyeglasses. This feminine beaded chain has silicone ends that slide over and tighten on the arms of your eyeglass frames. When you aren't wearing your eyeglasses, simple let them hang around your neck handy for the next time you need them. Approximately 27" in long. Handcrafted by fair trade artists in Guatemala as part of our mission to create economic empowerment for women in disadvantaged economies. I am fortunate to not need glasses (yet! remember I am turning 40 soon!) But if I ever need glasses, I will definitely wear these. The designs are beautiful, and there is a style and color combination for any taste. If they sound kind of familiar, you may have read my review of the BooJee Beads. I have a lanyard that I wear to church every week with my nametag. If you make a purchase at EyeGlassHolders.com or www.BooJeeBeads.com, you can receive a 20% discount on any purchase with the code: pinkmom. EyeGlassHolders.com will also offer a free eyeglass product to the 7th person who orders with this code. If you sign up for either sites' monthly newsletter you can be eligible for their end of month grab contest for a chance to win an eyeglass product. These are really pretty. I have a pair myself but only really wear them at night so I don't need the holders yet but my mom most certainly does!